International Olympic Committee (IOC) President Thomas Bach is in Los Angles meeting with the LA 2024 bid committee and visiting proposed Games venues, including the Staples Center near downtown where the NBA’s Lakers and Clippers play. 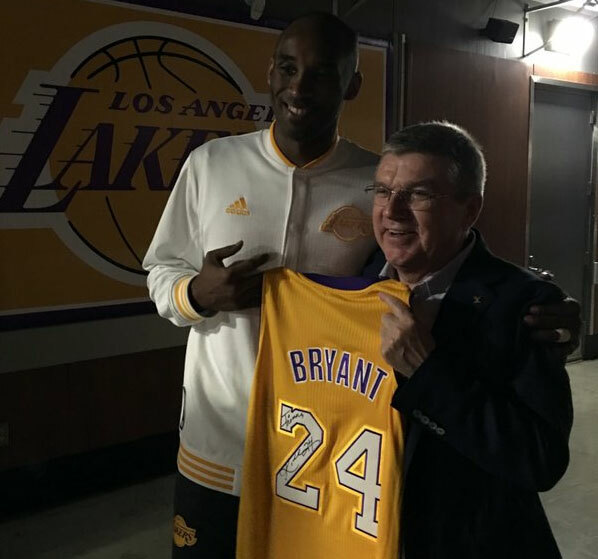 On Sunday evening Bach and his IOC delegation attended a Lakers game where the home team was defeated by the Charlotte Hornets 101-82. Last week the Staples Center was named host of the 2017 National Hockey League All-Star Game. Monday Bach and the IOC delegation will meet with Los Angeles Mayor Eric Garcetti, City Council President Herb Wesson and LA 2024 leaders. They will also visit USC and UCLA – home of the newly proposed Media and Athletes’ Villages – and the Getty Center. 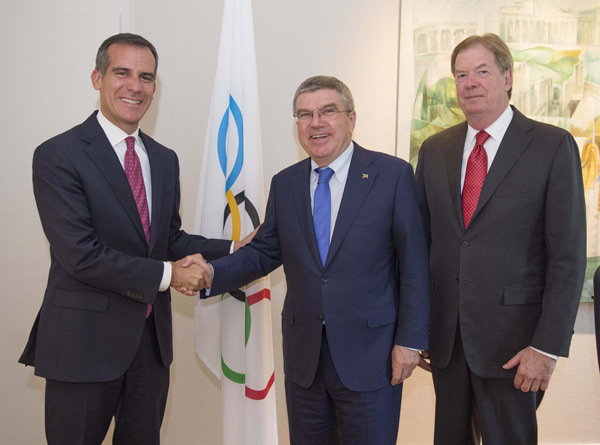 Garcetti said, “we are honoured to welcome IOC President Thomas Bach to the City of Angels. Los Angeles is a forward thinking city where possibilities become opportunities. We look forward to showing President Bach and IOC officials our plans to harness our creativity, innovation and fiscal discipline to create a new Games for a new era”. LA 2024 Chair Casey Wasserman said, “I want to thank President Bach for visiting Los Angeles and giving us the opportunity to discuss how our plans for a sustainable Games align with his visionary Olympic Agenda 2020 reforms. Guided by President Bach’s leadership, we are creating a Games concept that offers athletes the best, personalized experience through our ideal climate and existing world-class venues, leaving a legacy to inspire the next generation at home and abroad”. Tuesday President Bach will travel to the San Francisco Bay area to meet with technology executives. The IOC President typically only casts a vote in bid elections to break a potential tie in the results and rarely shows official support behind any one contender, but behind the scenes he could be influential in swaying opinions of other voting members. Though still early in the campaign, the visit is a rare opportunity for the bid team to highlight to Bach what the city offers. Bach already visited opposing 2024 bid cities Budapest and Paris late last year and he was paid a visit by Italy’s Prime Minister Matteo Renzi in January to discuss Rome’s bid. The first volume of the bid book along with guarantees are due in to the IOC February 17. The IOC will select the host city in Lima, Peru in September 2017.